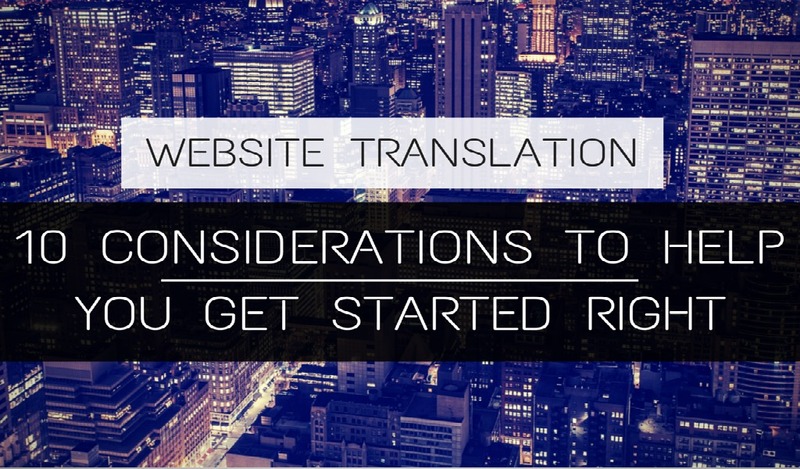 Are you planning to translate your website and aren’t sure where to start? We are here to help! Having worked on numerous website translation projects, we know that the process can be overwhelming at times. Which is why, in order to simplify things, we have come up with a list of 10 common questions relating to website translation. Contrary to popular belief, sending us your website URL is not sufficient enough for us to understand your needs, or provide you with an accurate quote. Your answers to these questions will help us better understand your needs, and and create a customized process for your website translation which will save you time and money! Additionally, providing full and accurate information at the outset of your project will ensure that things move smoothly and quickly, with an end result that will help your business succeed in new markets. Do you want your full website translated or only select parts of it? Is the content of your website handled by a Content Management System (CMS)? If so, which one? Are you or your webmaster able to provide the text for translation? Do you have access to your CMS? If not, can you gain access to it? Can you grant access to your translation provider? Does your website include graphics, Flash or other Rich Internet Application (RIA) content that require translation? What kind of encoding does your website support? Will you require Localization Services? Will you require Search Engine Optimization (SEO) of your multilingual content? Future updates on your website—will you need all updates translated, or just some? How do you plan to manage this process? Does your website contain any industry-specific terminology, or terminology that is specific only to your company/organization? 1) Do you want your full website translated or only select parts of it? In most cases, it is not necessary to have your full site translated, as the products/services you offer may not be the same across different regions. Even in the case where you do need your full website translated, we don’t recommend doing it all at once because it takes much longer to translate the full site in one shot. We usually recommend that clients have the core of their website translated- and go live- as soon as possible, while continuing to identify other parts for additional translation. Having a part of your website (a microsite) go online as soon as possible also has another major advantage: it provides you with some footing in the new region and allows you to start testing different marketing campaigns, which will in turn help identify what else should be translated. This will allow you to adjust your marketing priorities based on actual market responses to your product or service. 2) Is the content of your website handled by a Content Management System (CMS)? If so, which one? These days, the majority of websites are managed via a CMS. WordPress, Drupal and Joomla are just a few of the most popular ones. While each CMS offers similar features for English/unilingual (one language) websites, not all of them support multilingual websites, or at least do not support them equally. If you used an uncommon (individual developed) CMS to manage your website, you should check with the developers/administrators to see if it supports other languages. In addition, any optional (third party) plug-ins and website themes/templates might pose a challenge for another language. Make sure to check if the plug-ins and website themes/templates are compatible as well. The most popular CMSs usually have plug-ins available for managing the additional languages content. So it’s important to tell your translation provider what CMS you are using from the onset. 3) Are you or your webmaster able to provide the text for translation? This might require finding a solution to export the text for translation and import it back after the translation is done. Be advised that copying the text from the online pages in MS Word is never a good solution for so many reasons: it takes lots of time; it is easy to mess up the pages and the links; there are hidden page elements that need translation and you might not be able to just copy them – like the page title, page description, images alt tags and others. Plus, you need to make sure you will be able to place the translation back on your website. If you don’t know how to export/import the translation back, be prepared to allow access to your CMS to your translation partner. 4) Do you have access to your CMS? If not, can you gain access to it? Can you grant access to your translation provider? Allowing the provider to log in directly to the CMS/FTP and access will make the process much quicker, smoother, and precise. Having access to your CMS and FTP will allow our engineers to set up a customized translation and testing process for your website. This will include finding the best solution that will help you save time and money and reduce errors. Granting access to your translation provider means that we can test everything in the backend before it goes live to avoid any problems while your customers are viewing it. Again, is not necessary to grant your translation provider access to your CMS/FTP if you plan on importing and exporting all the text yourself. However, the option is available for those who prefer everything to be done by their translation provider. 5) Does your website include graphics, Flash or other Rich Internet Application (RIA) content that require translation? If translation is required, you should provide the working/editable files to your translation provider to be translated. Your translation provider can help with re-creating the language files. Additionally, the invisible metadata* information in the working file usually requires translation, and is also needed to carry out Search Engine Optimization (SEO). 6) What kind of encoding does your website support? Encoding is the process of converting a message or other information into code. If the website is managed via CMS, it’s usually in UTF-8 encoding, which supports the majority of–if not all–languages in the world. Otherwise, check with your website developer to see what the encoding is. If you have used a specific encoding intended only for a certain language family, you may need to convert to another encoding if you plan on translating into a completely different language family. While translation is not a direct word-for-word conversion, the meaning of every single word is conveyed in the target language. Localization goes a step beyond a basic translation; it is translation with cultural adaption. For example, one could translate a joke into another language exactly as it is read (without any cultural adaptation). However, unless the readers know the source language and its culture, they will not understand the joke. With localization, the joke is still there, but it is expressed in a way which the target language readers understand (but not the source language readers may not). Localization is crucial to the success of your marketing campaign when expanding your business into international markets. Check out this case study of a website localization project to see how the process works. Read more about the importance of website localization, and about how the localization process works. 8) Will you require Search Engine Optimization (SEO) of your multilingual content? Optimizing your multilingual content for search engines will help your website have a better chance of ranking in Google, Yahoo, Bing or other search engines like Baidu and Yandex, depending on your target market. However, Search Engine Optimization (SEO)* is a very complex process, it requires lot of work and takes a lot of time. Your translation provider will work with you to make sure that you start out on the right foot, and that you are covering the basic requirements for SEO. Selecting the right keywords for your website and making sure your webpages are optimized is the first step, and one of the most important. In some cases (depending on your competition), simply preforming these basic operations and building some internal links will be a very good start. To get started, it will be very helpful for you to provide your translation provider with the English keywords you have researched for your website. With the list of keywords in hand, Mutillingual SEO Specialists can start performing a multilingual keyword research to come up with the corresponding keywords in your target language(s). This process is conducted by native speakers of your target language, who have both translation and search marketing experience as well as in-depth knowledge of the target market, its customs and culture. This multilingual keyword research is an additional service and it is charged per hour. Once the best keywords are selected, translators will make sure to incorporate them into the translated copy of your text, including the page title, headings, and between the first 100 words of the copy (Search Engines place more emphasis on words placed towards the top of the page). *Search Engine Optimization (SEO) is the process of increasing the visibility of a website or a web page in a search engine’s “natural” or un-paid (“organic”) search results. 9) Future updates on your website—will you need all updates translated, or just some? How do you plan to manage this process? If you are translating your complete website, chances are very high that you will have future updates that will require translation. In such cases, you will need to manage the process very carefully to ensure that nothing is missed. When using common CMSs and their corresponding plugins, translating updates is a fairly straightforward process. Any un-translated content will show up in the CMS dashboard until you have either translated it, or marked it under the “ignore” list. With other less common CMSs, translating future updates might be a bit more tedious. As the site administrator/manager, you will need to provide any updated content to your language provider for translation and then put the newly translated material onto the site afterwards. 10) Does your website contain any industry-specific terminology, or terminology that is specific only to your company/organization? Like other intellectual property, terminology is a major organizational asset. Systematic management of terminology is a critical contributor to the quality and consistency of multilingual content your company produces. Your translation provider will need to be aware of any specific terminology before starting your translation project. In cases where very specific terminology is involved, your translation provider may ask for your help in understanding and defining the terms so that they can be translated accurately. If your company has ever had any materials (documents, manuals, etc.) translated in the past, it is very important that you share those translated materials with your translation provider. This way, they can make sure to keep the terminology consistent in all your company’s materials by translating the terms the same way they were translated in the previous material. Effective terminology management results in major cost and time efficiencies; preventing re-work, eliminating additional review cycles, and shortening the total turnaround time. With this information in hand, you are now well-equipped to confidently move forward with your website translation project! If you would like further information about website translation, feel free to contact us. Or if you haven’t done so already, fill out this free quote request form to get started today! previous post: So You Need a Multilingual Voice Over? next post: Fun Valentine’s Day Facts From Around the World!